Michelle de Young sings Kundry and Isult with lush beauty. Daniele Gatti arrived at Carnegie Hall with the Boston Symphony Orceshtra for their annual spring visit. Gatti had recently triumphed at the Metropolitan Opera conducting Parsifal in a consummate performance. Katrina Dalayman, the Met’s Kundry, reports that the group of mega stars gathered to sing were exceptionally collaborative, guided by Gatti, emailing back and forth. This group effort showed on the stage with the BSO. With the all Wagner program, you sensed the instrumentalists drawing together to unleash incredible beauty and listening pleasure. Gatti has been anointed by the powers that be in the Wagnerian Mecca, Bayreuth. His conducting is loving, thrilling, crackling with drama even in the silences. The music emerges often from a primordial quiet, which suits Wagner well. Music on this level fulfills our quest for meaning. Excerpts from Gotterdammerung formed the program’s first half. Serving up classic Gatti, the music starts with a shudder, a butterfly’s wings on the cello, and as the sun rises, tentative tones on the woodwinds. The color comes from the music. Gatti layers sounds, the violins sitting atop the lush orchestra, and then from the darkness, the Rhine motifs are clarion clear. The Tannhauser Overture followed the intermission. Its lacey, light music emerged from a magisterial opening. All the noise of the next section is sucked into The BSO’s luxuriant brass sound, somehow combining the bizz-zazz of New York Philharmonic’s brass with a rounder more satisfying edge. Mezzo Michelle De Young joined the orhestra for Kundry’s music from Parsifal, which was warm and yielding. Her performance in the final Liebstod from Tristan was exuberant and abandoned. Gatti leaves us wanting so much more. He has spent more time with the orchestra in Boston, as well as recent concerts at Carnegie Hall in New York and at the New Jersey Performing Arts Center, than any other conductor on the short list of candidates for music director. 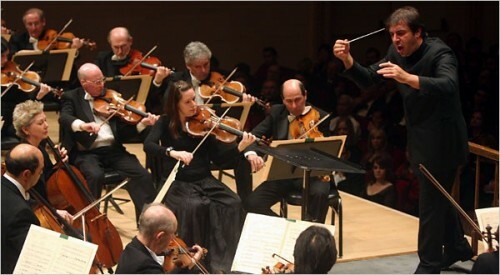 Last fall, Mark Volpe, managing director of the BSO, said that a new music director would be appointed by the spring. Not because either the players or the audience needed one, but because the institution should not go rudderless for so long. Now spring is here and the decision is still pending. Gatti may be an acquired taste. He is like Willy Decker whose opera productions are meditative translations of great works of art which take the director out of the equation. The conductor, players and audience hear the music in its pure form. Listening to Gatti, it was easy to imagine him in the Shrine of Our Lady of Einsiedein near Zurich, where Gatti is principal conductor of the opera. Once while walking in the meditation halls of Einseidein, where no woman’s foot had ever touched, I was moved to listen more attentively than before. On a more hirsute level, Gatti speaks about not having to watch a conductor to hear the music. His tonsorial style resembles that of a monk. Since this is spring, and Volpe’s wish is upon us, what are Gatti’s chances? People close to the BSO over the years think that Gatti is an unlikely choice, in part because La Scala is on his horizon, he is welcome in Bayreuth, and can have all the work he wants in Europe. Boston’s brass was not out in force at Carnegie, but Ronald Wilford, Gatti’s agent at Columbia Artist’s, was prominent in the center of Row T, with his presumed successor Jean-Jacques Cesbron. They disappeared upstairs after the performance. Was this a courteous appearance by agents? Gelb learned ruthlessness at his knee. If the exciting young Andris Nelsons, for example, were offered the Boston job, Wilford could have him eliminated from consideration. He continues to have that kind of power at 87. Many members of the orchestra seemed enraptured by Gatti. Martha Babcock, assistant principal cellist, was right under the conductor. Her smile was beatific throughout the evening. Babcock often closed her eyes to listen as did many other players when they were not performing. Once she even played one of those gorgeous Wagner melodies with her fingers on the strings—but did not bow- because it was not her turn. Other BSO players, however, report that the positive response to Gatti is not universal. One player actually said he did not enjoy playing for him. No straw poll result is available, but there are more reservations about Gatti than there are about Andris Nelsons. Nelsons is young, but not as young as Gustavo Dudamel in Los Angeles. In the music world Boston, however, is not Los Angeles. Manuela Hoelterhoff of Bloomberg, reports that Nelsons has been offered the job. Insiders wonder, if that is so, why he was alone backstage after a recent Philharmonic concert. Usually the business people in music pay homage to a potential music director of a major orchestra. Did they know that Nelsons had turned down Boston, or is the Hoelterhoff report only a guess? Nelsons is due for the Verdi Requiem at Tanglewood this summer. But even though he will be accompanied by his wife, who will sing the soprano part, he is only in for a day. There will be no time for a media meet and greet at the BSO’s summer home. Stephane Deneve, a French conductor who currently has a post at the Stuttgart Radio Orchestra, is probably the only other candidate of sufficient stature to be lurking on the horizon. His name is not among those currently mentioned. But journalists are not always on the inside track. Some speculate that the BSO is unwilling to commit and will appoint an interim music director while they continue to survey and test the field. Hearing the BSO at Carnegie, you are reminded what a superb orchestra this is, and how much they deserve a wonderful conductor who will commit for a solid term. "Last I checked Volpe made nearly $600,000. How is it possible that he hasn't found a successor since Levine's left -- or even before. What an indolent board. Just what are they waiting for? A sign from God? Sure Gatti would be a good choice and it really doesn't matter if he has other offers or jobs at the same time. All these dudes do. A handful of guys make millions presiding over orchestras that see them maybe three months out of the year. At this point, why not surprise us with somebody who's still on the way up, someone like Stephane Deneve. I watched him start in the nineties, and he was impressive even then. And that hair! Fantastic." "You have put great unique views in this content. I agree with many of your primary points. This information is clearly written for readers that enjoy very challenging content. This is perfect for us thinkers."